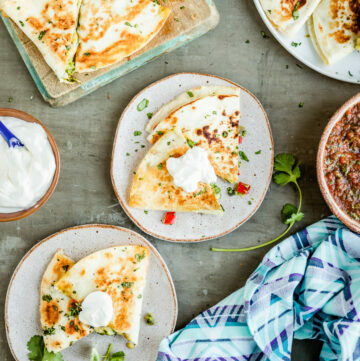 There is not one person among us who could not benefit from a quick weeknight dinner recipe. 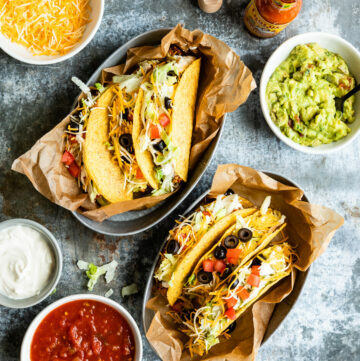 As much as I love to be in the kitchen, I have a job and a family and most nights during the week I have about 30 minutes to devote to preparing a meal. Not a minute more. 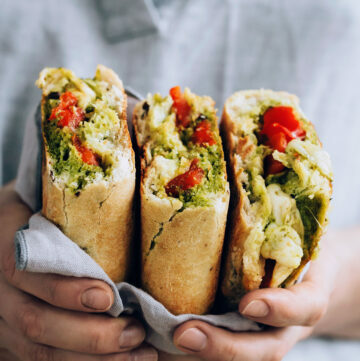 As a result, I’ve had to get creative in the past with scouring the pantry and refrigerator to see what I can put together (quickly) to feed my family in as healthy of a way as possible. 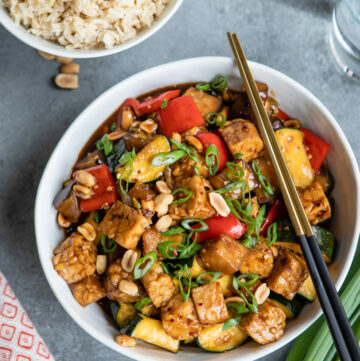 Regardless of whether or not I meal planned over the weekend (in most cases I did not) I try to have a stock of versatile vegetables in the refrigerator that can be used in a multitude of ways – soups, frittatas, and a great stir fry are my favorite go-to meals. 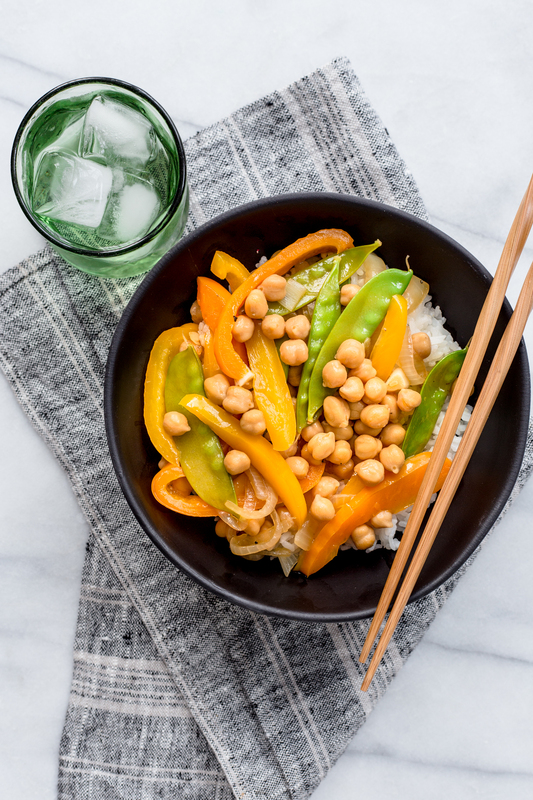 This quick chickpea stir fry is the ultimate pantry dinner. 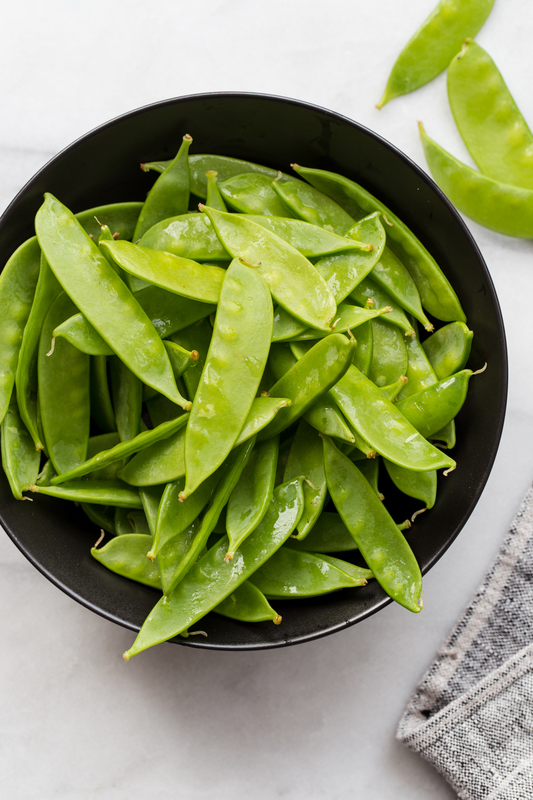 I am never without cans of beans to either toss on a salad or in this case, toss in my stir fry for a great meatless protein option. 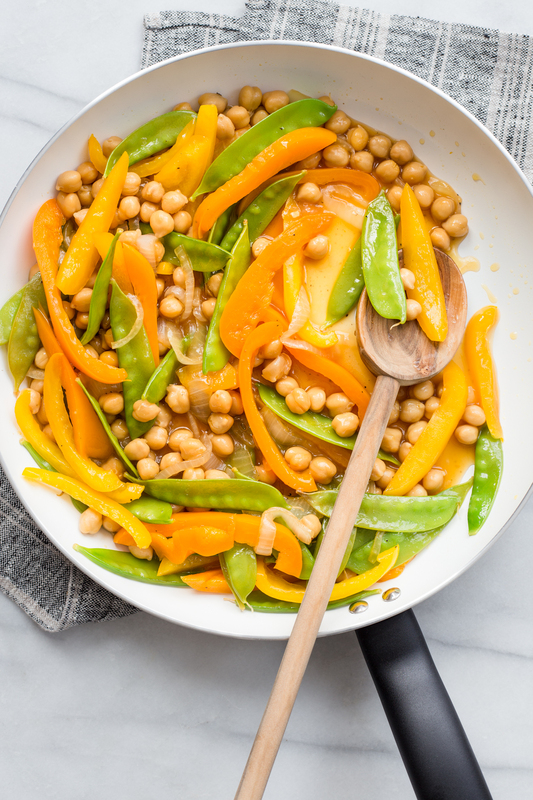 This entire stir fry comes together in less than 30 minutes. I get a small pot of rice simmering on the stove while I chop my vegetables and prepare the simple Asian-inspired sauce. I like to serve this chickpea stir fry with white sushi rice, but you can use brown rice or even your favorite noodle. You will notice in the recipe that I made a batch that is big enough for 6-8 people. I cook with leftovers in mind. This is a nod to the fact that there are some nights during the week that I only have time to reheat leftovers. Because of this, I tend to cook enough food to feed my family for two nights knowing that there will be a practice or a meeting or something that will cut into cooking time the next night. 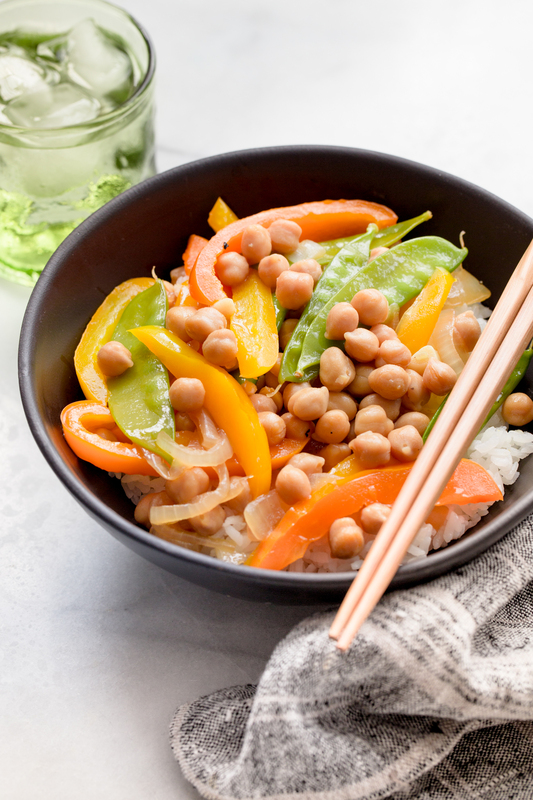 If you would like to make a smaller batch of this quick chickpea stir fry, simply cut the ingredient amounts in half. Feel free to substitute your vegetables based on what you have in your fridge. 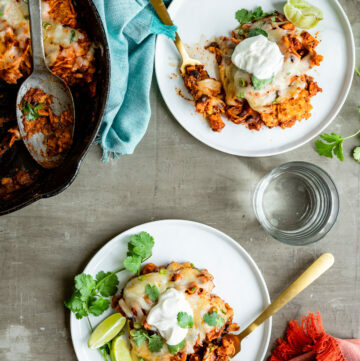 What are your favorite go-to weeknight meals? 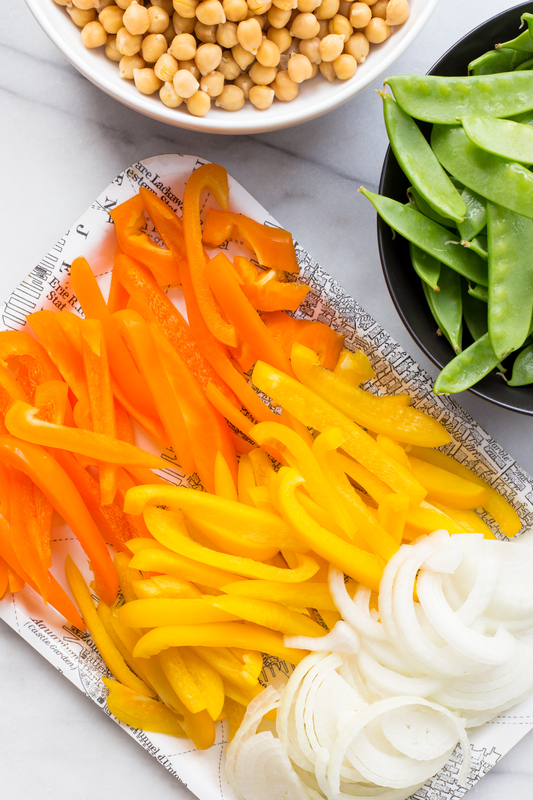 Cut and prep peppers, snow peas, onions, garlic, and chickpeas and have them on hand before cooking. 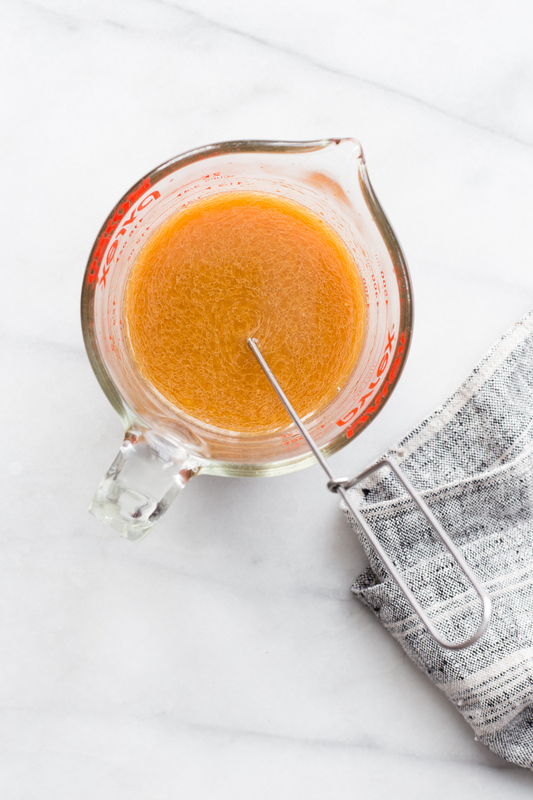 In a bowl or large liquid measuring cup, whisk together broth, soy sauce, vinegar, sesame oil, and cornstarch until smooth. Set aside. Heat avocado oil in a large non-stick skillet or wok over high heat. Add peppers, snow peas, and onions and cook, stirring constantly, until onions start to soften; about 3-5 minutes. 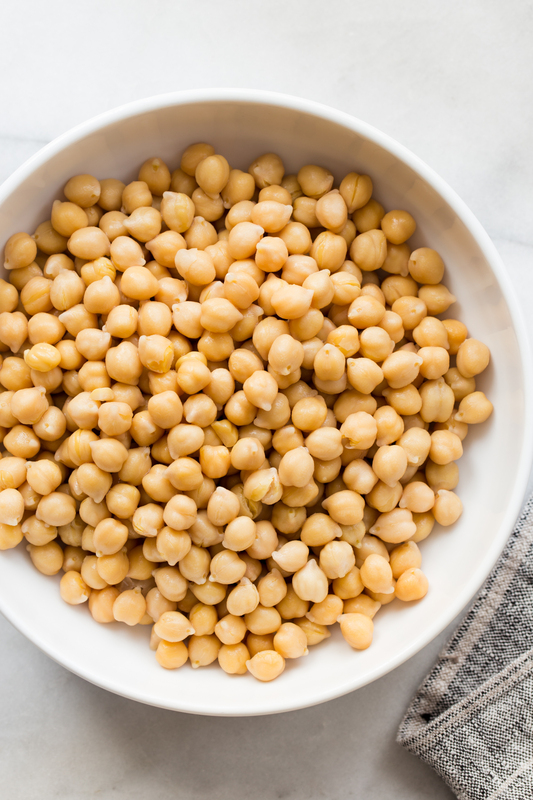 Add in garlic and chickpeas and cook an additional 3-5 minutes, until vegetables become tender but retain their crunch. Pour in sauce, stir, and bring to simmer. Allow mixture to simmer for about 3 minutes or until sauce is slightly thickened. Serve stir fry with rice or noodles.